When it comes to combating the harmful elements that our vehicles face day to day, you need a strong, reliable product, that maintains the new look of your vehicle, while helping protect the finish from a variety of harsh conditions such as acid rain, hail, bird droppings and more. We have extensively researched various paint protection products and NONE offer the same level of protection as Xzilon. 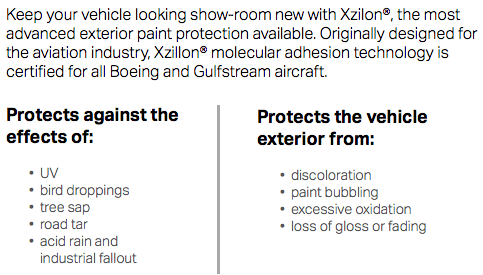 Xzilon Paint protection is a protective coating that is applied directly to the exterior paint of your vehicle. It brings out and maintains the lustrous exterior finish of your new vehicle. Hyundai of Goderich paint protection carries a 10-year exterior finish warranty. This warranty protects all exterior painted surfaces of your new vehicle from permanent damage caused by tree sap, bird droppings, UV depletion, road tar, acid rain, industrial fallout, and insects. Your warranty will also guarantee the finish of your new vehicle and any discolouration, fading, or loss of gloss caused by the Sun will also be covered.